Two of our favourite ever Nerf blasters are the Hyperfire, and the Modulus Tri-Strike. One shot darts at an incredible rate (seriously check out that link to see a rate-of-fire test), but couldn't combine with anything else, while the other fired slowly, but could be altered to create a bespoke weapon. 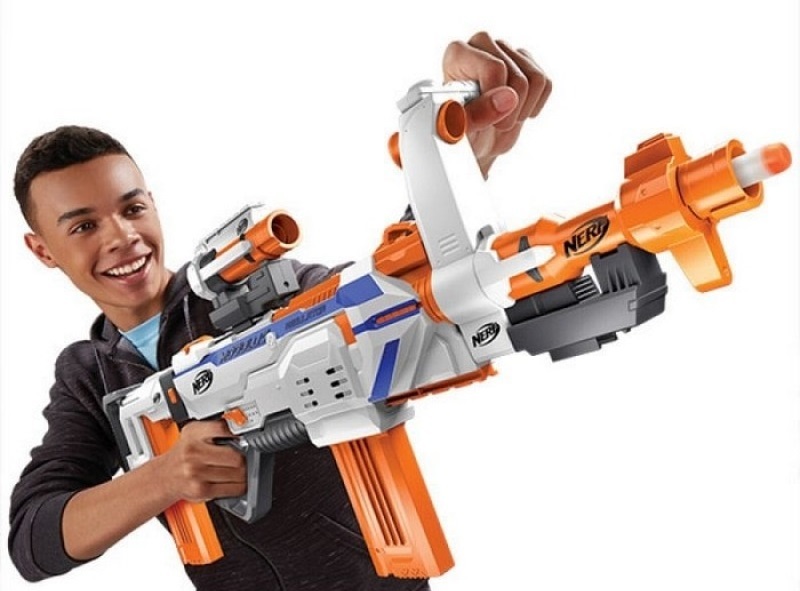 So imagine our glee when we heard about a new Nerf blaster that could both shoot very quickly AND and be adapted with accessories. Oh, and you can alter the rate of fire, too. Eek! We excitedly review the Nerf Modulus Regulator. For those not in the Nerf-know, the Modulus range of blasters are so called as they are designed to be customised and combined with other blasters, accessories, and parts. The aforementioned Tri-Strike is a great example of this, having three separate (and independently working) shooting sections. The Regulator is a little different, being just a single blaster (battery-powered, unlike the Tri-Strike) but with an array of included accessories to change the shape and form. This is what you get: the main Regulator blaster itself, two 12-dart clips, 24 white Modulus darts, a stock, two barrel extension pieces, and another weird barrel part with a handle on top. That's a decent mix of kit, especially because of the two clips and darts to fit in both. Value. This is how Nerf recommends you initially set the blaster up, with one of the barrel extension pieces acting like a scope, lining up with the sight hole in the handle. The stock, as you can see, can also accommodate the spare clip, making quick reloads a breeze. Looks pretty cool, eh? Well, maybe apart from the folded-back handle. It can rotate through 360 degrees, offering you a slung-low grip, quite like the Nerf Mega Mastodon. However, we think it looks even better when you put both barrel parts on the barrel itself. They are infinitely connectable, as both feature male and female connection points (which we'll prove later). Here's the reason for Regulator name: you can regulate the amount of darts this thing fires. You have a choice of one, three, and continuous. Select one and the blaster will fling just a single dart when you pull the trigger. Remember this is a motorised fly-wheel blaster; the kind, like the Hyperfire, that usually just keep blasting until the clip is empty. Flick to three, and each trigger press will shoot off three darts. The blaster contains a sensor on the indie that actually watches for the darts flying by, shutting off the dart feeder after three go by. Clever. However, select continuous and that rubber conveyor belt will keep on rolling, sucking all the darts out of the clip and into the fly-wheels. It fire with a similar rate to the Hyperfire, but remember that each supplied clip contains only 12 darts, unlike the Hyper's 25 dart drum. You'll be out of ammo in no time. 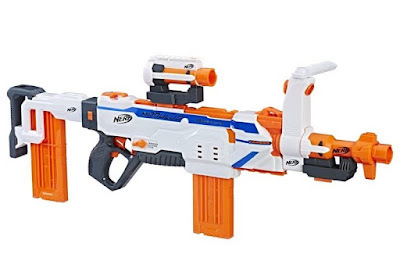 On that note, the Nerf Modulus Regulator, when stripped down to the simplest form, performs in pretty much the same way as the Hyperfire. It feels like Nerf might have used similar, if not the same, internal parts, but we're not complaining about that at all. If you wanted, you could wield the Regulator without any of the add-ons and it would perform excellently - with the added benefit of being able to choose your rate of fire. ...you can actually fit another blaster to them. We fitted the First Order Stormtrooper Blaster there (which we featured in this video), meaning we had an extra pump-action gun on the front of the Modulus Regulator. Yes, it does add a tonne of weight, making it necessary to wield the blaster with that folding handle. The fact that it does that is pretty fun, however, and you could add many different types of blasters to it. So we got creative and made this: two modules from the Tri-Strike and the drum clip from the Hyperfire. It makes the blaster ridiculously long and ungainly, but it shows you how that barrel can just keep going, and how the main blaster has a universal stock mount on the rear, and a tactical rail on top. Despite being of the Modulus range, the Modulus Regulator is compatible with anything from the Elite series. Combine and shoot! So you might not end up using it as they recommend, but the Nerf Modulus Regulator is the best of both worlds: high-powered and effective AND modular and customisable. 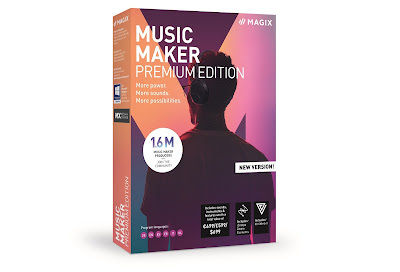 Double win from us, so check it out.